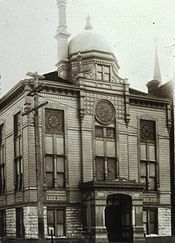 The Jewish Historical Society of the Upper Midwest (JHSUM) is the leading organization in the Upper Midwest dedicated to telling the story of 150 years of Jewish history in the region. Founded in 1984, JHSUM provides programming, publications, exhibits, and curriculum to the local and regional community, as well as offering reference and reproduction services to all interested users. Our collection is particularly strong in the areas of Jewish homesteading in the Dakotas, Northern Minnesota Iron Range Jewish communities, Minneapolis and St. Paul synagogue records, Jewish women’s organization records, and materials reflecting life on Minneapolis’s North Side Jewish community. Connecting creative people to our collections is at the heart of our mission. No shortage of things to do!